EcoSys is the global standard for enterprise project controls software. Our customers execute some of the world’s largest projects and rely on EcoSys EPC to implement best practices for full lifecycle project controls including project cost management, project portfolio management (PPM), capital program management, budgeting, forecasting, estimating, workforce planning, and earned value management. These perspectives have greatly influenced the design and capabilities of EcoSys EPC (Enterprise Planning & Controls), the flagship web-based project controls software platform from EcoSys. 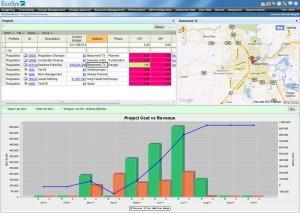 EcoSys EPC (Enterprise Planning & Controls) is a full lifecycle Project Controls software platform. A web-based platform, EPC provides the deepest capabilities to support the complete spectrum of solutions within the Project Controls discipline – from project portfolio management and capital program management, through budgeting, forecasting, and performance reporting. EcoSys EPC bridges the gap that has traditionally existed between planning and managing project execution. EcoSys EPC is used by both the public and private sectors, and by owners and contractors alike. EPC excels in three areas: (1) it delivers the ability to perform best practice project cost controls directly within the system. However, most organizations have good data in multiple systems. As such, EPC was designed to serve as (2) a world-class integration platform as well, facilitating the creation of a “single version of the truth” that encompasses data from schedules, cost actuals, commitments and contracts, timesheets, and more. With that data, EcoSys EPC leverages its (3) built-in reporting engine to provide automated, real-time reports and dashboards, controlled by end users rather than a reliance on IT or outside consultants.